Survival stories, whether family survival stories or individuals, have always captivated imaginations. It’s because of their ability to draw you in to experience the drama vicariously. They make you wonder if you’d have the grit and wherewithal to make it through to the other side. Many of the best survival stories are about an individual stranded in the wilderness where the only adversaries are nature and his own mind. Aron Ralston’s a good example. He’s the guy who went out for a casual day of light hiking and rock scrambling and ended up amputating his arm after getting it wedged between an 800-pound boulder. Joe Simpson’s another case. He was left for dead by his climbing partner in the Peruvian Andes after falling into a 150-foot crevasse. Despite lugging around a broken leg, Simpson somehow crawled back to camp three days later. There are also many stories about groups of people surviving insurmountable odds. John Krakauer, Scott Fischer, and Rob Hall’s haunting Everest expedition in 1996 certainly ranks near the top of that list with 8 people ultimately dying on the trip. Then there’s the 1972 plane crash in the Andes with the Uraguayan rugby team, some of whom resorted to cannibalism to survive. But, there are fewer stories of families who get stranded and must work together to survive. These, I think, are especially amazing in light of how it’s a wonder any of us survive a single family holiday get-together without killing each other. And that’s just a few hours. Can you imagine what it would be like if you were lost in the wilderness with your family for days or weeks? Good grief. Well, here are a few stories to prime your imagination. First, and maybe the most famous, is the Robertson family from Staffordshire, England. 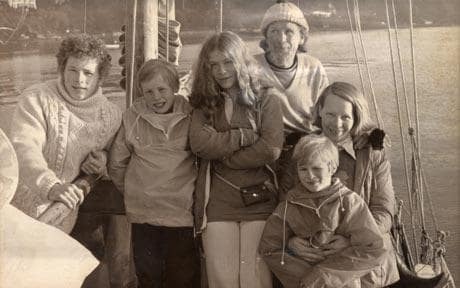 In 1971, Dougal Robertson, a retired naval officer, sold his dairy farm to buy a 42-foot sailboat and travel the world to give his kids an education they’d never forget. Douglas, the oldest son, who was 18 at the time, said his father didn’t plan a shred for the trip. In fact, they didn’t even practice sailing in the harbor before setting out to traverse the globe. Mr. Robertson’s days in the navy paid off, because they sailed for almost a year and half without incident. But, then 17 months into their adventure, a pod of orcas off the coast of the Galapagos Islands slammed into them, apparently intentionally, and damaged their boat enough to sink it. The Robertson family was lost at sea for 38 days before being picked up by Japanese fishermen. They had survived on turtle meat, and turtle blood when rainwater was unavailable. Douglas said, “I never regretted the trip even in the darkest hours.” Now, that’s commitment to the family. OK, for those of you who have read Ollestad’s book Crazy For The Storm, you’re probably thinking, “didn’t his family die in the plane crash?” Yes, you’re right. This is technically not a story about a family surviving great odds together, but it’s included here because Ollestad’s story of survival would be incomplete, and maybe not even possible, without his family, and especially his father. Norman, 11 years old in 1979, was flying on a small Cessna airplane with his father and his dad’s girlfriend. The plane got caught in a disorienting blizzard that blinded the pilot and caused them to crash into the San Gabriel Mountains in Southern California. The pilot and Norman’s father died on impact. His father’s girlfriend survived, but was in shock and fell down a chute to her death while trying to descend the snow-covered mountain. After nine hellish hours of blustery descending, Norman made it off the mountain to be rescued. Norman later explained that his dad told him to never give up and said his father’s life lessons while growing up surfing, skiing, and playing hockey were the reason he survived the ordeal. We’ve all seen the images of the devastating 2011 tsunami that struck Japan traveling inland up to 6 miles and killing over 15,000 people. It was caused by a magnitude 9.1 earthquake, the largest ever recorded in Japan, and created a maximum surge height 133 feet tall. You also remember the 2004 tsunami that hit Indonesia wiping out 230,000 to 280,000 people in its path. The 9.1 magnitude earthquake that caused it produced a maximum surge height of 167 feet tall. That’s the height of Niagara Falls. So, imagine how terrifying it must have been on July 9, 1958 for Howard G. Ulrich and his 8-year-old son when their fishing boat was lifted up by a 1,720 foot tall tidal wave. The tallest wave ever recorded, this megatsunami was tall enough to engulf the Empire State Building. The tsunami wave was caused by a violent earthquake that shook loose a massive rock slide into Lituya Bay in southeastern Alaska. Some 40 million cubic yards of rock—that’s enough material to fill 280 football fields, each 8 stories high—slid down 3000 feet from the surrounding mountain peaks into the bay. The wave obliterated trees and everything else in its path, which Howard and his boy Sonny were right in the middle. Somehow, their boat stayed afloat and upright as they literally surfed the biggest wave in history. That was probably enough father-son bonding to last several lifetimes. 4) Mom Keeps 5 Kids Alive Homesteading In AlaskaIf that headline doesn’t sound impressive to you, you don’t understand what homesteading means.Norma Cobb was the last woman to claim land in Alaska under the Homestead Act. In 1973, she and her family moved to Alaska with a dream of a fresh start in a wild land. They understood it would be hard work, but they had no idea just how hard.Upon arriving in the 49th state, they learned that the only land they could claim was north of Fairbanks just a few miles from the Arctic Circle. Undeterred, they settled in the breathtaking Minook Valley where gold miners passed through in the 1800s on their way to the Yukon, and where Jack London wrote some his short stories.While beautiful, the area was as wild as it could get. There were 20 grizzly bears for every 1 human. Indian legends spoke of a “bushman,” a huge, hairy, man-like creature who stole children. The reality was bears often cased their property in the shadows stalking the kids, the oldest of which was 9, and the youngest just a 1 year-old. The average temperature in winter was -18. What’s more, it was basically the Wild West. Maybe worse. Ruffian neighbors from miles away would attempt to burn them out and shoot at them to force them to leave their claim.Left alone with her 5 kids while her husband searched for work months at a time, Norma kept her family safe despite running out of food, having to make repairs to their cabin, and literally fighting for their lives. If you think you’ve got it tough raising a family, you might read the book Arctic Homestead for a fresh bit of perspective.5) 6-Year Old Rescued By His 2 DogsWe all know how pets can be just as much a part of our family as our kids. Well, just in case you had any doubt, this story will set your mind to rest on the subject. A little over 4 years ago, a 6-year-old boy was playing with his two dogs near his home in Seneca, Missouri. The boy and his dogs wandered into the nearby woods and soon became lost. His parents recall that one minute they saw their son playing in the backyard, and the next minute he was gone. They quickly called the police, who assembled a search party that included a helicopter. Hours passed and the parents began to get really scared. It was early January and temperatures dropped quickly that night to the low 20s. The boy was small enough and was gone long enough that he could easily die of exposure. Close to midnight, the search team found the boy delirious and disoriented lying in a ditch. Other than a few scratches and tears in his clothes he was perfectly fine thanks to his two dogs who never left his side. In fact, the boy was found with his two dogs lying down on either side of him keeping him warm and safe. The boy’s parents had no doubt the dogs would have stayed with him all night if they needed to. You know that sinking feeling you get in your stomach when your car slips a little on an icy road and you’ve got your whole family inside? Well, this story of family survival will send chills down the spine of any parent. By the end of it, you’ll be sure to carry extra food, water, and warm layers on every road trip from now on. In December 2013, a couple and 4 children rolled their Jeep into a ditch deep in the mountains of Nevada’s high desert. The youngest kid was 3, the oldest 10. Incredibly, none were seriously injured in the wreck. As a result, they were faced with the question of whether to pack up a few things and hike down the road with little ones to try to find help, or stay put and hope a rescue team would find them. The family decided to stay put even though they were hundreds of miles away from the nearest town. They stuck together and built a fire to stave off temperatures that dropped to less than 20 below zero. The fact that they stayed together is what search and rescue team members said kept the family alive and led to their rescue three days later. More importantly, they had packed the car with plenty of water, extra food, and winter clothes. Without that foresight, the family wouldn’t have survived. So, the next time you spend the holidays with your family, you might want to cut them some slack. You never know when you’ll really be stuck with them in a life or death situation. If that headline doesn’t sound impressive to you, you don’t understand what homesteading means. Norma Cobb was the last woman to claim land in Alaska under the Homestead Act. In 1973, she and her family moved to Alaska with a dream of a fresh start in a wild land. They understood it would be hard work, but they had no idea just how hard. Upon arriving in the 49th state, they learned that the only land they could claim was north of Fairbanks just a few miles from the Arctic Circle. Undeterred, they settled in the breathtaking Minook Valley where gold miners passed through in the 1800s on their way to the Yukon, and where Jack London wrote some his short stories. While beautiful, the area was as wild as it could get. There were 20 grizzly bears for every 1 human. Indian legends spoke of a “bushman,” a huge, hairy, man-like creature who stole children. The reality was bears often cased their property in the shadows stalking the kids, the oldest of which was 9, and the youngest just a 1 year-old. The average temperature in winter was -18. What’s more, it was basically the Wild West. Maybe worse. Ruffian neighbors from miles away would attempt to burn them out and shoot at them to force them to leave their claim. Left alone with her 5 kids while her husband searched for work months at a time, Norma kept her family safe despite running out of food, having to make repairs to their cabin, and literally fighting for their lives. If you think you’ve got it tough raising a family, you might read the book Arctic Homestead for a fresh bit of perspective. We all know how pets can be just as much a part of our family as our kids. Well, if you had any doubt, this story will set your mind to rest on the subject.